Remote Access connections are secure and encrypted using industry standard SSL protocol and authenticated through your CONS3RT login session, including your project, roles and permissions. Under My Runs or Browse, select an "Available" Run. On the Run page, there will be a card for each virtual or physical host. Each card will have a connection button that, when clicked, will display all available Remote Access options for the system. If there is no Remote Access button, Remote Access may be disabled in your Cloudspace, contact your Cloudspace Admin to resolve. To retrieve credentials, click on the card for the host you'd like to connect to, this will open the details page for the host. On the left-side of the page under Your Credentials, click the Show button to retrieve your credentials. Note, this page reflects credentials set when the Run was initially launched, and would not reflect changes made in assets or manually. See this article for additional information about the custom user and password. 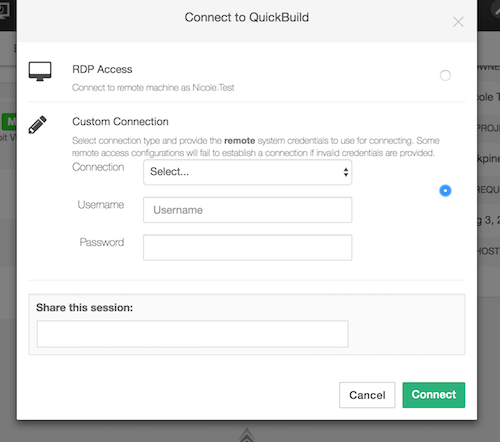 Click on the Remote Access Connection button, the credentials you entered when creating the deployment run will automatically be transferred into the session but you can always log in as a different user by selecting custom connection. Keep an eye out for a pop-up that may need to be allowed. Note: See this troubleshooting article if you have issues connecting. Select the Connection button on the card for the desired machine. Within the "Share this session:" box you can search the username, name, or e-mail for any member within the project the Run is shared with. Once their names have been selected and the session has started the users that were invited will receive and e-mail with invitation instruction. NOTE: Invited users connect to your session in view-only mode. Invited users cannot move the mouse nor enter text. For the password, use the same password created when the run was launched. Click here if you need to retrieve credentials. Appliances are pre-configured snapshots of a VM, and therefore already have pre-configured credentials associated with them. Please check the Help section on the Appliance to retrieve the credentials. For security reasons, your remote sessions will close when you log out of CONS3RT. You will be reminded to stay logged in. Multiple remote access windows or tabs can be opened simultaneously. However, this is limited by your browser's settings for number of sessions and connections. In order to optimize performance, it is recommended to have no more than three windows or tabs open at a time. This method of access is not compatible with Internet Explorer 8. The feature is also unavailable in any browser that does not support the canvas element. *The host name and DR number is displayed in the Dashboard which when clicked can link you to your DR's page where you can remote access in if enabled.